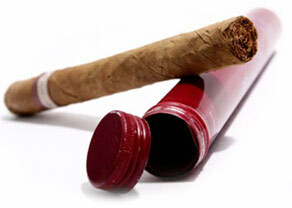 Why do Cigar Smokers need Life Insurance? For some people smoking cigars presents an image of authority, self assuredness and class whereas for others it gives them relaxation and acts as a means of distraction when they are tense. Whatever the reason that people crave their favorite cigar, there are reasons enough to warrant the need for life insurance for them. When a person lights up a cigar, an incomplete combustion of the tobacco results in odorous smoke which is noticeable for a long period of time. Each gram smoked emits around 50mg of carbon monoxide, 130mg of carbon dioxide, 4mg of isoprene and traces if acetaldehyde and hydrogen cyanide. The smoke of cigars is considered more alkaline than the smoke of cigarettes and is therefore more readily absorbed in the mucus of the mouth. This way the nicotine is absorbed more readily even though the smoke is not inhaled completely. Just like any other form of tobacco smoking cigars poses significant risk to health depending on the amount you puff. The more you smoke and the longer you smoke, the more vulnerable you become. The level of risk covered by cigar insurers also varies with the depth to which we smoke. Health risks can be similar to that of cigarette smoking in cases where the person smokes several times in a day. Statistically cigar smokers are more than twice at higher risk to periodontal disease, different types of cancer more prominently such as that of throat, mouth, esophagus and tooth loss. Many insurance companies put them in a different category than that of cigarette smokers. Different parameters are followed for assessing risks for different type’s and intensity of tobacco users. The cost of life insurance for cigar smokers is twice as much for a tobacco user who is lumped in it than for persons who smoke just one stogie in a month. Cigarette smokers are always put in the category of tobacco users and they usually end paying a higher premium for their insurance coverage. Nowadays many insurers have started putting cigar smokers in the non – tobacco category. Cigar use is viewed differently by each company. Some insurers will give you the liberty to smoke one in a month and still offer you the cost of non – tobacco users, while others can pull up the mark to up to four cigars in a month. Some others with a really big heart may allow you to puff an unlimited quantity and still qualify you for the non – tobacco user category. The bottom line is to speak the plain truth while talking to your agent about life insurance for cigar smokers, on how often you smoke or whether you do not smoke at all. The information you give will help your agent to direct you to the right insurer which will offer you the best coverage at the lowest cost possible. Before picking on the insurance companies to get coverage, make a study of the insurance policy of the company. Some insurers consider cigar smokers no different to that of cigarette smokers. That way you will end up paying higher premiums for your coverage than you ought to be paying. Some insurance companies may put an applicant in the category of non smoker in case he or she has not puffed in the past three years. They must disclose everything at the time of filling up their initial application. They should no longer smoke more than a cigar a week. The urine sample must be nicotine free for twelve months before the exam. Apart from infrequent cigars the applicant must not consume tobacco in any other form. Some insurance companies are generous enough to give you coverage at the rate of non tobacco users even if you test positive for nicotine. A person taking up coverage of five hundred thousand dollars for a term of twenty five years will be shelling out around four hundred and fifty dollars in a year. Many people are the master of disguise and for smokers it is not an uphill task. As per the study, in around 4 – 5 days of abstinence, an addicted heavy smoker will be as good as a person has never smoked a cigarette. Such a person can clear a nicotine test with ease and qualify for non-smokers coverage. In response to it the Government is now emphasizing on stringent and random testing methods to issue life insurance for cigar smokers. Buying a term life insurance policy is a contract between you and the insurance company and therefore it should be based on truth. In case something happens to the applicant soon after they were insured and it is found that they lied in the application than the claim will be nullified or in some cases the cigar insurer may pay nothing at all.